As the term implies, more than one workpiece is entering the powder coating booth at a time. 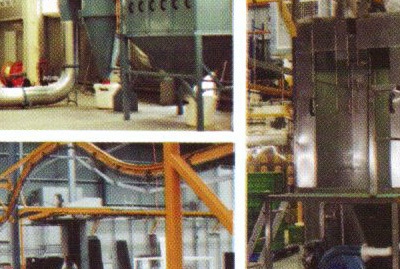 Mounted on a bank of hooks or some other material-conveying mechanism, the parts are simultaneously charged, coated, and then moved to the curing oven. 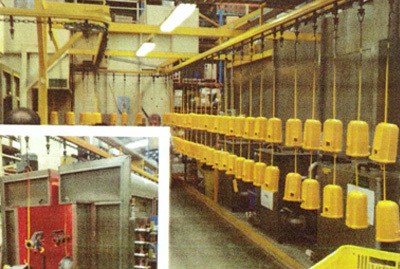 Meanwhile, in a powder coating factory at the other end of town, the line is automated. Every stage of the process is self-completing. Spray quantity is known, as is the temperature in the oven. The staff are all located in the pre-processing room, then they're hooking the parts to a chain-driven line of specially routed hooks. There's not much else to do, not when all of the processing parameters have been locked into the project run. Batch processing work does not favour this automated approach, and here's why. Greater flexibility is the upshot of a semi-automated powder coating cycle. But that system feature can quickly turn against the system operator if the equipment isn't configured properly. First of all, multiple parts poised for action inside a powder coating booth, well, they're going to require extra prep work. After all, the powder distributes predictably over a single part, maybe over two identical parts, but that's not the case when a batch operation takes place. The many parts, suspended in the sealed enclosure, need to be spaced. In this way, each part collects the required coating and there are no blind spots anywhere in the powder coating booth. Similarly, the oven temperature has to rise to accommodate the batch. 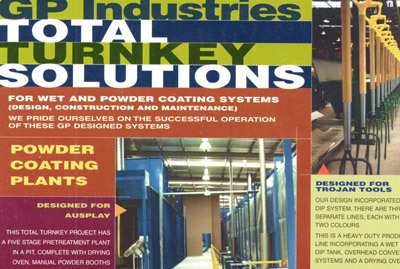 Essentially, batch systems work well in powder coating operations, but they're difficult to fully automate. Because the process is no longer fully automated, a new semi-automatic approach is adopted. The parts are conveyed manually. They're spaced and turned in the booth. Thanks to the extra work, the coverage of the resin-loaded powder is maintained, although an adjustment to the charging equipment is likely as the batch loads alter in size and mass. Finally, the curing oven needs adjusting. In point of fact, someone needs to be on hand at each station to adjust all processing variables. Potentially faster, batch processing systems suffer when the necessary adjustments are mismanaged.